Sky Racing World, is set to offer the opportunity to bet live on Australian Harness Racing to North American gamblers. The subsidiary of Australian online betting operator Tarbcorp, through its advanced deposit wagering partners will be simultaneously broadcasting Australian harness racing every Sunday and Monday night. 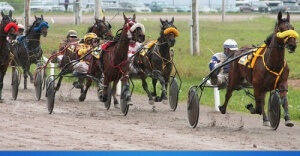 From the 7th of October, North American bettors will be able to wager on Australian Harness Racing. An Australian Harness Racing champion horse by the name Lazarus, won a race at the American Hoosier Park Racing & Casino on the 10th of August this year. The horse who is also affectionately known as the Wonder from Down Under, captured the North American audience. Since then the popularity and demand for Australian harness racing significantly grew, leading to this move by Sky Racing World. The move will allow US online gambling players to enjoy betting on Australian harness racing from across the world. Sky Racing World will partner with its North American advanced deposit wagering (ADW) partners to simulcast Australia’s biggest horse races. Races will include those run in South Australia, Victoria and NSW. There are over 70 ADW partners that will be simulcasting the races including Xpressbet, Bet America, WatchandWager and TwinSpires just to mention a few. Sky Racing World’s President and CEO, David Haslett, said: “US harness racing has been available in Australia for several years, so we’re excited to extend the two markets’ relationship by bringing the best Australian harness racing to North America, where interest is just as strong.” He also went on to comment on how this move reflects on the standard of Australian thoroughbred breeding and racing, saying: “Harness racing complements our core Australian thoroughbred racing product, which continues to hold the international spotlight following the history-making performances of horses like Winx.” This is a great business move for Sky and a big step for the Australian gambling industry. Sky Racing World will simulcast Australian Harness Racing to over 425 different ADW operators not only in USA but in Mexico, Canada and the Caribbean as well. Stay on onlinepokies.site for the latest gambling news and reviews of top recommended Australian Casinos and casino games.